In late 1992, Novotrade International released a game that was radically different from the deluge of platformers that had accumulated on the Genesis like so many barnacles on an old ship. Ecco the Dolphin broke most of the conventions of the genre, and gave gamers a chance to explore the ocean in an expansive adventure that was both captivating and unique. A far cry from 1993’s monster kill-fest hit Mortal Kombat, Ecco distinguished itself for its non-violent gameplay and emphasis on puzzles. More than a decade and several installments later, people are still eager to swim with Sega’s cetacean star. The company once known as Novotrade International no longer exists. Renamed Appaloosa, they have been developing and producing software since 1983. Though famous for its Ecco games, modern enthusiasts will recognize it as the developer of the Playstation 3D Contra games, and Three Dirty Dwarves on the Sega Saturn. Also among its creations is the unusual shmup Kolibri for the 32X, which is unlike any other game in the genre. Currently, Appaloosa employs over 60 software developers, screen artists, and other personnel; and has its headquarters in Palo Alto, California. It also owns two software development companies in Budapest, Hungary, and a children’s web service in the U.S.
Ecco the Dolphin was the creation of Ed Annunziata, who was responsible for several other well-received Genesis games, such as Fantasia, Spider-Man vs. the Kingpin, & Chakan: The Forever Man. After several years with Sega, he and friend Gerry Blau left in 1996 to form their own company, AndNow LCC. Together, they have released several games for the Playstation and mobile phones. The franchise began with Ecco the Dolphin, which was released in 1992 to little fanfare and even less advertising (though it sported some incredible Boris Vallejo cover art). It would appear that Sega either wasn’t entirely confident in the game’s potential sales, or were simply too busy with other releases to give Ecco the push it deserved. Quite unfortunate, given the true originality of its premise. Exploring the ocean was something that gave Ecco the tools it needed to carve out a new niche of platformers. The Genesis at the time was absolutely flooded with Sonic clones, and Ecco’s emphasis on exploration and its intricate puzzles provided gamers with a new take on the tired old formula. It was also a sharp contrast to Mortal Kombat, released early the next year, in that it was entirely non-violent, and promoted helping others in order to proceed, as opposed to defeating them. It is ironic that those who were causing a major controversy about the level of violence in video games at the time completely overlooked Ecco the Dolphin as an example of a how a game could be entertaining without the inclusion of blood or gore. The storyline in Ecco is as original as its gameplay. After his pod disappears in a terrible storm, Ecco sets out to locate it and find out what caused the massive tempest. Along the way, he encounters other cetaceans known as “singers,” and travels the world’s oceans in search of his missing family. He is eventually sent through time by the Asterite- the oldest living thing on Earth- and eventually discovers the source of the storms, a mystery that dates back millions of years and involves an alien species. That may sound like a lot for a mere bottlenose dolphin, but Ecco is no ordinary mammal. His most obvious feature is the pattern of stars on his forehead, which form the constellation Delphinus. Moreover, through the use of his “song,” a variation of the dolphin’s power of echolocation, he could activate a map that would guide him through the massive stages throughout the game. The song could also be used to activate glyphs, which provided him with information or opened new passageways to explore. As you progressed through the game, the song could be upgraded twice; the first, in combination with a charge, turned it into a long-distance weapon. The other made it temporarily disorient sharks (Ecco’s arch enemies) when sung at them. The first game in the franchise was immediately recognized for its supposedly tremendous difficulty. Was this distinction warranted? Perhaps not today, but back in 1992, many gamers were not used to the intricacies involved with maneuvering an aquatic mammal! In addition to Ecco’s standard health meter (recharged by eating fish or singing at clams), you also had to keep tabs on his air supply. This little addition made navigating through caverns and other enclosed spaces especially tricky, since it was entirely possible to get lost and drown. Once you got a handle on where to find sweet oxygen, however, the game wasn’t as hard as many people made it out to be. After his splash debut on the Genesis (ha! ), Ecco eventually found his way to Sega’s other active consoles of the era. The Game Gear and Master System renditions were quite similar and did a commendable job of emulating the Genesis original, but it was the Sega CD version that really stood out. It featured a stunning soundtrack by Spenser Nilson (Sonic CD, Batman Returns) that made the adventure more immersive than ever, and the inclusion of Q-sound really showed off the Sega CD’s great sound features. Whale and dolphin cries, along with other ocean sounds, provided the perfect backdrop for undersea travel and adventure. Aside from the audio upgrade, however, the game remained essentially the same. Even so, fans consider the Sega CD version of Ecco the Dolphin to be the best, as the new score adds greatly to the sense of immersion that the whole game tries to create. Sega was quick to follow up with a sequel, and Tides of Time appeared a year later. Nothing major from the fist game was changed, but a few new dynamics were added. Through the use of Metaspheres, Ecco could transform into different creatures to overcome certain obstacles. Which form you could take depended on the level, and Ecco could assume the shapes of sharks, jellyfish, a seagull, or even a school of fish. Moreover, the song power ups returned, and were now usable right from the start. New 3D stages appeared, and were used to travel between stages via the use of teleportation rings. The level of detail seen here was incredible, and served as a powerful testament to the proficiency Novotrade had with the Genesis. The story also picked up right where the first game ended, and took something of a Back to the Future II-like turn, involving a skewed timeline that had to be restored. Apparently, Ecco’s efforts to save his family resulted in two possible scenarios: a happy one where dolphins and humans lived in harmony, and a dark, mechanical world of death. The Asterite had also been shattered and needed to be restored in order to bring about the final battle that would save the world. The developers apparently had high expectations for the sequel, and sometime in February 1994, an early version of Tides of Time was burned to a testing EPROM. Ecco creator Ed Annunziata called it a “pre-alpha build,” which suggests that very little (less than 20%) was actually completed. Although it consisted mostly of placeholder levels, there were quite a few never-before-seen sprites and stages. Many of the ideas seen in the prototype were eventually incorporated into the final game, but more than a few were buried, never to be seen again. Sega CD and Game Gear versions followed the Genesis release, with the CD game again boasting a Spencer Nilson soundtrack and Q-sound. 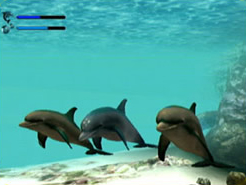 Tides of Time on CD went beyond the standard redbook audio improvements, and included a plethora of information on dolphins in general, as well as offering FMV sequences detailing Ecco’s quest. Very nice for a CD release! By this time, the Ecco games were finally recognized by Sega as a legitimate, though under-appreciated franchise, and another game was in the works, this time targeted at a younger audience. Ecco Jr. debuted as part of the Sega Club line of games and featured a much younger dolphin hero. It also lacked the brutal difficulty of its predecessors. In addition to Ecco, you could now take control of a killer whale and a baby dolphin, guiding them through a series of tasks for Big Blue, the blue whale. It was long enough to warrant a password feature (all of which were included in the manual), and while not the standard fare most older games might expect, it was surprisingly fun and worthy of the Ecco name. Video games were not the only place Ecco was turning heads. He appeared in two six-part series in Archie’s Sonic the Hedgehog comic book in 1993 and 1995. Unfortunately, not much merchandising was done beyond that, another indication of how reluctant Sega was to push the property. After the release of Ecco Jr., it was naturally assumed that the series would make the jump to the 32X, since both of the main games had already appeared on the Sega CD. In fact, Sega presented a video at the 1994 Consumer Electronics Show that showed a 3D CG-rendered video of Ecco jumping through the letter “O” of his logo. Immediately, rumors abounded of an impending release on the much-maligned 32X. There was also speculation that the game might be a Saturn release, and some photos found their way into a few magazines, but were eventually debunked. According to Mr. Annunziata himself, no 32X or Saturn Ecco game was ever in development, and the videos and screen shots were all just meant to promote the hardware. With this revelation, poor Ecco was forced to remain confined beneath the waves until 2000, when the Dreamcast found itself struggling to gain a foothold in the market. Defender of the Future heralded the return of the aquatic star to a Sega console, and its August 2000 release pleased Ecco fans everywhere. Though it had nothing to do with the previous games continuity-wise (a different team was behind the development this time), it was still the same dolphin we knew and loved. Now in full 3D, every effort was made to retain the same fluidity of gameplay the original games enjoyed, although this was not entirely possible when such a drastic change in perspective occured. Ecco’s charge attack and sonar radar both returned, as did his health and air meters, and you still swam by pressing and holding an action button. You could now increase the amount of health you had by collecting power ups called Vitalits. A quick 180-degree turn was implemented, and you could also swim backwards. Your song was radically improved, and there were a slew of new power ups that added new abilities, such as doubling your air supply, invisibility, and making certain other species (like schools of fish and turtles) follow you around. These new features were put to good use in the new environments, which were among some of the most beautiful on the Dreamcast. Truly, Defender of the Future‘s most memorable trait was its ability to realistically create Ecco’s world, giving the true sensation of a living, breathing ocean. The colors and graphics detail were astounding, and the game as a whole gave a solid feeling of being underwater. Schools of fish littered the undersea landscape and could be eaten! The sunlight reflected off of the ocean floor, and there were tons of plant life waving in the gentle currents. It was simply beautiful, if not flawless. Defender tried so hard to accurately create a realistic marine world that it was almost a bit too ambitious for the hardware at times, and the DC’s limitations were occassionally made visible. There was considerable fog, and pop up was annoying at times, but the engine was very good overall. One can only imagine what the game would look like on more powerful hardware, especially those on the horizon. I would love to get my hands on an Xbox 360 remake, with full visual effects and 5.1 surround sound! Continuing the legacy of high difficulty established by previous entries, Defender of the Future dropped the password option for a save feature. Considering how long and labyrinthine the levels could be, gamers were quick to appreciate this minor improvement. With a storyline penned by science fiction author David Brin (the Uplift series, The Postman), the game is generally regarded as an alternate universe. For half a millennia, humans and dolphins have coexisted peacefully, even going so far as to explore space together. Their journeys attracted the attention of a hostile race known only as “the Foe,” which traveled back in time to stop the unity of the two species. In what appeared to be a homage to the second game, Defender of the Future sent the player through various timelines in order to ensure that Ecco’s future survived. Through the brilliant use of CG cut scenes and a stunning musical score, Defender of the Future proved to be the biggest and best Ecco game to date. It was ported to the Playstation 2 soon after, but would sadly end up as the last outing for the noble dolphin. Even with all the success the Ecco games have enjoyed over the years, it seems that Sega still refuses to take the franchise seriously enough to provide regular installments. Not a new phenomenon, given how fans practically have to beg for new games unless Sonic or Puyo Puyo are involved. Why it would snub such a refreshing and original series is beyond me, but then again, we are talking about Sega. This is one of the most original series to ever come forth from the publisher, and it is a testament to the fact that new twists can be placed on tired genres, breathing into them new life and excitement. None of the Ecco releases have ever received much advertising or hype, yet the series has managed to endure for almost a decade, over six different systems. With Sega’s recent announcement that it plans to revisit classic franchises on the next generation of consoles, it wouldn’t surprise me in the slightest to see Ecco return. I’d be pleased to see any revival at all, even on portable hardware, but only time will tell if Sega has any future plans for their aquatic hero. Until that time, fans will have to continue to swim the oceans of Sega’s past hardware. Game Info, Ecco the Dolphin (Multiple Titles). The Dark Sea. Game Info, Ecco the Dolphin (Multiple Titles). Wikipedia.